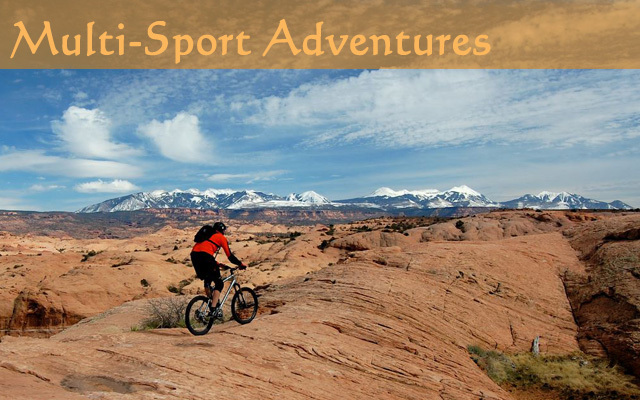 Moab, Utah is the premier multi-sport destination in the United States, and is the “Adventure Capital” of the world. The area is a paradise for outdoor enthusiasts as well as a geological wonderland. The town of Moab is nestled in a valley with the 12,000 foot La Sal Mountains on one end and the mighty Colorado River on the other. All of this is surrounded by 1,000 foot red rock cliffs and breathtaking, rugged desert terrain. There are also two national parks found minutes away from the town of Moab: Arches National Park, and Canyonlands National Park. These parks offer many spectacular views and experiences, including whitewater rafting down the Cataract Canyon section of the Colorado River, and hiking to Delicate Arch - Utah’s famous icon. These are the ultimate no hassle vacations for you and your family! 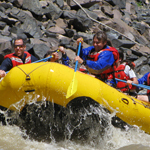 The 5 day /4 night Colorado River Multi-sport Adventure is an active vacation with a combination of thrills and chills! From jaw-dropping rappelling to roaring whitewater rapids, this trip is not for the faint of heart. 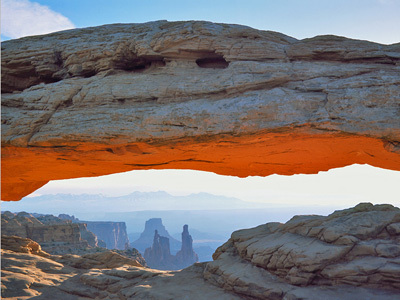 Activities include: a Sunset hummer tour over looking Arches National Park, Canyoneering from arches, taking a jet boat ride down the Colorado River, rafting the Class V whitewater of Cataract Canyon, and a scenic flight over Canyonlands National Park! This trip also includes all the meals and 2 nights in Moab Utah. 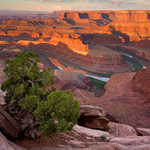 On the 4 day/ 3 night Moab Adventure Vacation you spend three nights in the heart of Moab Utah at Best Western Canyonlands. Activities include a sunset hummer tour over looking Arches National Park, a mountain biking adventure on some of Moabs Famous trails, rafting in wild Westwater Canyon, and Canyoneering through arches and red rock slot canyons. This trip also includes all your meals.